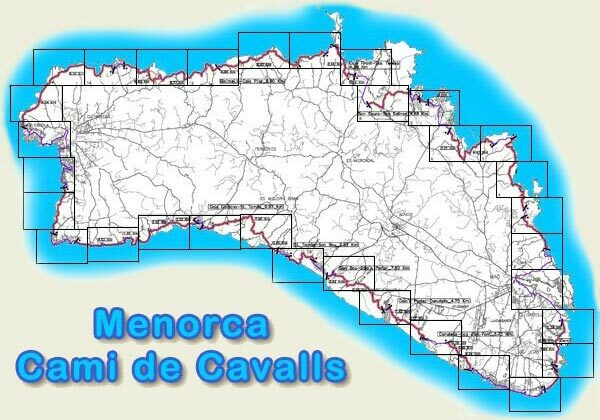 Cami de Cavalls is the ancient coastal pathway completely circumnavigating the island of Menorca. It was originally used a highway to enable warning of impending invasion to the Menorcan people. It has now been completely re-opened for the first time in over over 400 year. To view the pathway in detail click the square outlines in the area you wish to view. This symbol on the maps means I found some of these maps are not entirely accurate. Where I find these I correct them on our walking pages along with Google maps route 'files.kmz'. Please note although all the information I have indicates the pathways are open to the public there may be areas where public right of way is either limited or does not exist at this time. Please be aware of this and respect private land and property.